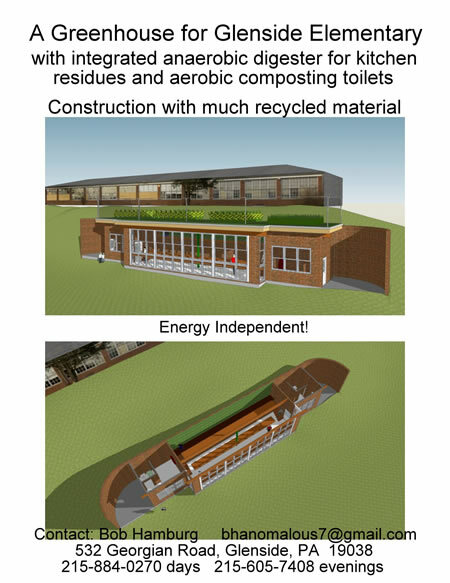 A greenhouse for Glenside Elementary with integrated anaerobic digester for kitchen residues and aerobic composting toilets. I first seized upon the approaching demolition of my old elementary school as a prime opportunity. There was an exceptional south-facing, east-west running hillside into which a greenhouse could have been built using windows and masonry from the old school. A 3-4’ in diameter, rubber tube digester would have been set against the inside back wall of the greenhouse and would have been fed cafeteria scraps — and perhaps other food scraps from some local restaurants. Composting toilets would have been placed in each of the equipment rooms at both ends of the greenhouse. Thus, both pathways for the semi-cycle of return would have been manifested along with all of the possibilities for (re)growth both within the greenhouse and on its roof. It seemed to me that the educational value gained by and from children living with such an installation would make it undeniably attractive. Little did I understand the functioning of school board bureaucracies… Even though the system received high praise from functionaries and demolition was not to begin for nearly six months, the greenhouse was judged to be far too late for consideration. I still have hopes that such a system may be taken up after the new school is completed — or at some other school where local sustainability will be increasingly recognized as important. In hopes of furthering such activity, I have developed a series of 13 diagrams of spheres of concerns and effects related to such a system – a simple overview, a more detailed overview, and separate diagrams for each of the primary areas of concern. I continue to seek the right place.